The world’s only plant bracket competition, Shrub Madness® is a thrilling contest that pits shrub-against-shrub in a fierce single-elimination tournament. Based on the college basketball playoffs, 64 Proven Winners® ColorChoice® shrubs compete in a no-holds-barred battle for the chance to be crowned National Champion. Spanning March 1-30, a selection of proud and determined shrubs move through six rounds of competition. Winners of each shrub matchup are chosen by popular vote as participants fill out their bracket predictions online and root for their favorites. Starting in 2019 the Shrub Madness team took their popular “Shrubs Center” broadcast to Facebook Live, broadcasting at the beginning of each round of voting and there are always several opportunities to score dozens of prizes. At the end of each round, samples of top-scoring plants are awarded via a random drawing of registered participants. At the end of Shrub Madness, four bracket voters are randomly selected to win a collection of the las t four plants standing, known as the Floral Four. The player with the bracket prediction closest to the tournament’s results wins a grand prize pack, the coveted Floral Four and Plant Geek Swag Bag. Shrub Madness 2019 has concluded. Coming from a crowded field of 64 contenders, on March 26 the competition narrowed to the Floral Four which included Pugster® Blue Buddleia, Let’s Dance® Rhythmic Blue® bigleaf hydrangea, Suñorita™ rose, and Tuff Stuff Ah-Ha® mountain hydrangea. March 29 begain the last round of voting between Tuff Stuff Ah-Ha® hydrangea and Suñorita™ rose. 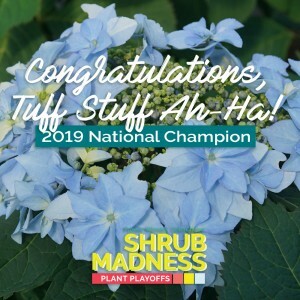 In the final few hours of the competition the hardy hydrangea soundly defeated the winsome rose and was ultimately crowned the 2019 Shrub Madness National Champion. A winners list can be obatined by sending an email to the Spring Meadow marketing team.